Forsaken Kingdom is an online video slot with a theme inspired directly from the legendary story of the King Arthur and the Knights in Forsaken Kingdom. The game is a 5-reels with 3 rows and 20 paylines slot powered by Rabcat software developer. 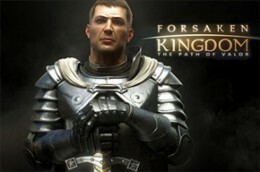 Forsaken Kingdom offers to its players 3D graphics, multiplier prizes, free spins feature and wild and scatter symbols. The lower value symbols are the usual playing cards (10, J, Q and K), while the higher value ones are the sword Excalibur in the stone, King Arthur, Camelot, and the Black Knight. The wild symbol is represented by Lady Guinevere and the scatter is the shield.